Next week is the 3-year anniversary of Long Now’s Interval cafe and bar opening to the public in San Francisco. Since 02014 we’ve produced sixty-six long-term thinking lectures at The Interval. 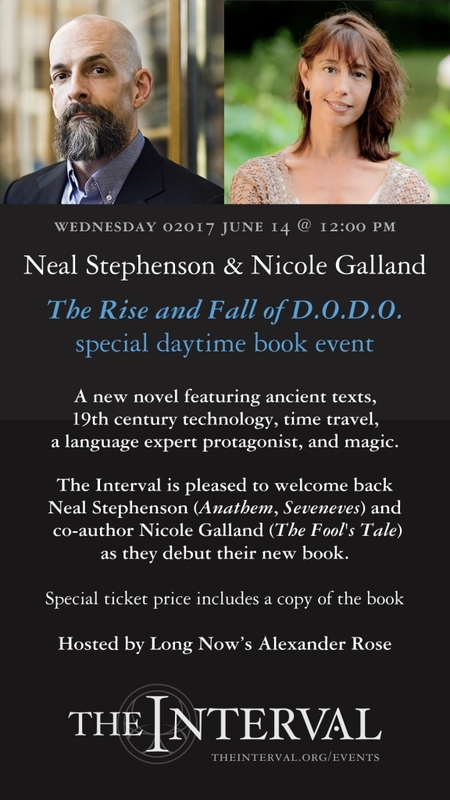 On this milestone week we’re pleased to welcome authors Neal Stephenson and Nicole Galland on Wednesday, June 14, 02017 to discuss their novel The Rise and Fall of D.O.D.O. which debuts next week. This will be a special daytime event that starts at noon Pacific Time. Tickets for this event sold out in less than an hour to Long Now members; one of our member benefits is early access to buy Interval event tickets. But, as we do for all our talks, we will host a live video stream of this event—starting at 12:30pm PT (UTC -7:00). The earlier time will we hope allow Long Now members and fans around the world will tune in, as it’s a more convenient hour in many time zones than our usual evening talks. You do have to be a Long Now member to watch on the Long Now site. Membership starts at $8/month and comes with lots of benefits. So we hope you will consider joining if you are not yet a member; and if you are, we hope you will spread the word! 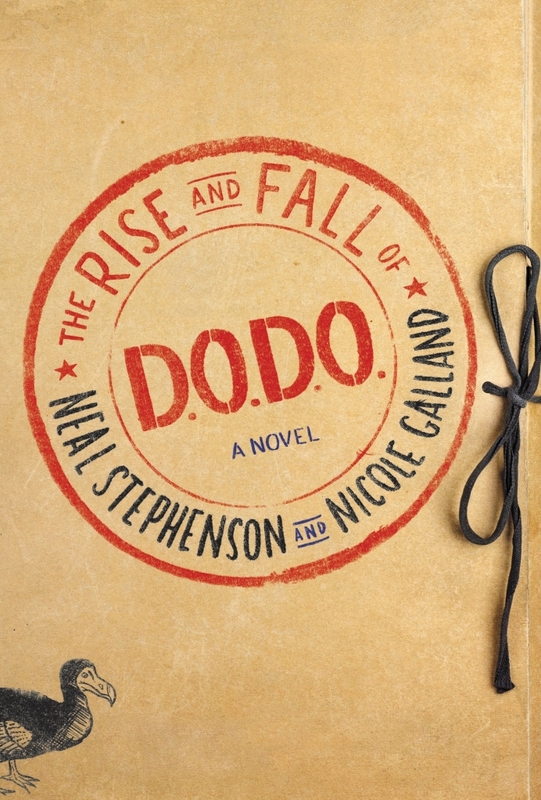 19th century technology, a language expert as protagonist, and magic. Sounds like the perfect summer reading for imaginative long-term thinkers! This is Neal’s second visit to The Interval. In 02015 he talked about his novel Seveneves with Stewart Brand. Video of that talk is now live on The Interval site. 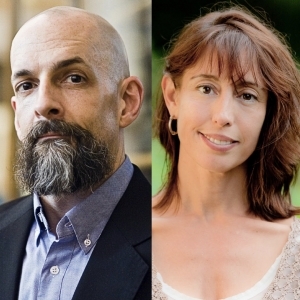 He and Nicole will be joined in conversation by Long Now’s Executive Director Alexander Rose. Neal’s long-time connection with The Long Now Foundation goes back to 01998 when he offered some design ideas about the 10,000 Year Clock to our co-founder Danny Hillis. Those sketches became the basis for his novel Anathem, published a decade later, which Neal launched with a Long Now event in San Francisco. In 02014 he not only gave us a list of books for the Manual for Civilization project, but he personally donated to help us build The Interval. All of this makes his and Nicole’s visit during The Interval anniversary week even more special. We’re excited to learn more about the book and to share this event live with our members everywhere. We hope you will join us! More about the June 14 event.